Odissi dawned on me like divine revelation due to the genius of Guru Surendra Nath Jena and the wonderful guidance of my Guru Pratibha Jena Singh. A guru is found by us, but actually he awaits us, waiting to impart to us wisdom that was meant only for us. With my Gurus as well, it was as if we had some connection from the past. There was an unbroken thread that brought me to find my artistic and spiritual answers in his dance, which were actually lessons and meditations on the universe. I have been immensely lucky to be one of the few dancers to be blessed with learning Guru Surendra Nath Jena’s Odissi style. Guruji is the only Odissi guru to have created compositions on Shaivite, Vaishnavite, Shakti and the Tantra traditions. Guruji has also fully explored the much neglected bhayanak and bhibhatsa rasas. 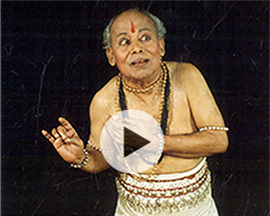 If there is a radical, unique way of expressing Odissi, it is in the style of Guru Surendra Nath Jena. The British Academy in London has funded a documentary on the Odissi dance reconstruction by Guru Surendra Nath Jena, recognising its remarkable documentation of Orissa’s temples and its culture. A beautiful place or melody finds us revisiting it again and again. There is an extraordinary pull that drives us to revisit a special sacred place inside us each time we experience it. Some of us probe deeper to search and discover the greater mysteries that constantly elude us. Guru Surendra Nath Jena was one such person, who had the courage and perseverance to follow the dance of the divine as it dawned on him. Like a mystic, he searched for a deeper meaning to Odissi, a deeper purpose and a different form from what he had known. The greatest works of art in the world are created often by minds engaged in a deeply spiritual dialogue with the self, and immense emotional turmoil. God-realization in art is a process of tremendous internal dialogue. The parameters by which such an artist works, are generated by his own spiritual journey and beliefs, untouched by his contemporary influences. The works of art that result are highly individual and powerful works of creation. The journey of dance for Guru Surendra Nath Jena was one such search, resulting in an extraordinary style of Odissi. With Guruji, life and dance not only mirrored each other, they both emerged as a multi-layered experience. A wonderfully simple, child-like and humorous person, Guruji’s dances reflected the same spontaneity, earthiness and humour that he epitomized. While Orissa’s temple sculptures were his main inspiration, his genius brilliantly recognized that these poses stemmed from many aspects of Orissa’s rural culture. His dance style that emerged from these inspirations, was traditional, yet radically individual, reflecting a richness of life experienced and a lifelong search for one’s ‘own’ truth. It is this persistence of his ‘own’ search that resulted in his unique Odissi style. A style that not just brought together Orissa’s temple sculpture with its living, rural culture, but dealt with diverse faiths like Vaishnavism, Shaivism, the Shakti and Tantric traditions. The most deep rooted in Guruji was his saint-like nature, constantly invoking God and seeking his ‘roop-darshan’. He studied the Gita and the Geeta Govind to constantly probe for a deeper revelation of divinity. His dances reflected his deep religiosity and a personal relationship with God. In fact, one of his compositions, "Venu Gatha”, was conceived from his personal relationship with Shri Krishna. It was Guruji’s birthday and he penned a poem for Shri Krishna out of his deep love for him. His profound insight into texts like the Ramayana and Mahabharata resulted in dance pieces that are masterpieces, remembered for a lifetime by those who saw them. As students we have been immensely attached to his warm, loving nature and greatly inspired by the unique character of his Odissi dance style. In dancing his dances, we experience his tremendous understanding of Indian religion and philosophy, his heightened sense of aesthetics, and the tremendous melody of his heart and soul. Indeed we have been fortunate to hold Guruji’s hand and discover the realms of the divine.